Adam Scherr is an American wrestler and strongman, who wrestles in the WWE and is billed as standing a colossal 6ft 8, which he says himself "I'm Six Foot Eight, 420 pounds". I mean look at me, I'm 6'8 and 385 lbs., I mean Braun is pretty fitting. I can't see Strowman being only 325lbs. No less than maybe 345 IMO. i know most wouldnt agree with me but these are my personal estimations. yes dude i also think he is over 6'6 flat maybe a weak 6'7.yes dude i agree he may be on the cusp of a weak 6’7” at best. Given his weight, his height might fluctuate a little at times more so that other wrestlers, after a few hours of lying down he might regain half an inch. Walking around with 325lbs on his back probably takes him down to his low rather quickly. He is likely somewhere between 6'7.5/6'8 straight out of bed. His low probably 6'6.5. I'm surprised given his 'monster' status that they've never tried to put him in big boots to make him look even bigger, his footwear is always normal. Barefoot I think he would just edge 6'6.25 Corbin out but it would be very close. strowman is visibly taller than 6'6 guys like corbin and taker i say 6'6.5 for strowman and i would even buy a weak 6'7 for strowman. Braun Strowman can't be much taller than 6'6". Just look at him standing next to David Justice. Justice was about an inch taller, and Justice is 6'7". He doesn't look more than a half inch taller than Gronk there. @ canson dude my bet is taker can be either 6'5.75 or still 6'6,not less not more. If his chin is at 176 cm. Then that is a pretty small head for a guy his height. I feel 174 or 175cm is more like it, possibly 173. I can not see this guy having a 8-head proportion or smaller. @Edwards: he is taller. Maybe 1/2” or 3/4” if angle is off. But I think Taker may only be 6’5.75. I could give anything from 6’5.5-6’6 for Taker as I’ve always said. Anything more or less than 198 or 197 (respectively) though doesn’t seem plausible. braun is clearly taller than taker its just camera angles. I think this guy is 6'6.5. 6'8" in wrestling shoes, it depends. Rob if his 200cm how tall someone has to be so he has a full head on him if he looks straight ahead? Sometimes looks like a head taller then 176 finn,but not always.. It's more likely guys in that range have a head 25-26 or even at a push 27cm range. So potentially a guy around 200cm might have the tip of his chin close to the top of the 176 guys head. @ canson yes dude,my estimation is similar to yours,he could edge taker and corbin by 2 cm. Flat 6'6. No more. Shorter than Kane, equal to Eric Rowan, Baron Corbin and Undertaker. Though Undertaker is an old man with many unjuries and his posture is not good these days. Almost flat? Lol, he wears construction boots in the ring, which are even a bit thicker than regular wrestling boots. Most of the other big guys have a huge footwear advantage. Braun Never seems to have big heels on. His boots almost look flat. He looks 199cm next to 206cm Enes Kanter so that could be right. Strowman at Times looked shorter than kane by 1/4 inch, but always kane used big footware. It’s impossible list strowman shorter than kane today. 1/4 inch of difference can be given by the type of shoe. Strowman can be considered at the same height as kane. Honestly...in that homemade video, Braun is 1/4” taller than Kane, when they both stood perfectly straight at the staredown. Maybe...maybe, the same height?...but, I blew up the still shot...Braun looked 1/4” taller. And we know Kane’s footwear is bigger than everyone’s. 0:40 6ft 7 seems right whatching this video..
How big did the difference look between Strowman and Rowan? Rowan complitly taller than corbin. Looks shorter than 6'6 Rowan, I believe he's shorter than Baron Corbin too, he wears big Big boots, 6ft5 3/4 is my barefoot guess, look at the pics with 6'7 Aaron Judge, definitely shorter. Roman looks slightly taller than Strowman here; I don’t think strowman is wearing lifts like he does now? When came face to face with big cass (6ft 8), he looked not shorter than 1 inch. With kane looked very close and considering the footwear disavantadge, i think is probably the same height in normal clothes. Taller than 199 cm corbin over 1 cm onestly. Braun has a giant head and giant forehead (the normal size is about 8-9 cm i think, strowman about 11-12 cm is possible from the level of the eyebrow to the top of the head) the 6 ft 2 guy are just below the level of the eyebrow.. Considering this pic and the footwear advantage for mark, is possible 6ft 7 ?? I'm not sure he really looks as much as 6ft 7 with most other wrestlers. I'd put Rowan somewhere equal to Braun so at least 6'6.25". @FrankR1 I've not seen him look shorter and certainly not by an inch. They tend to look quite similar with Strowman sometimes looking slightly taller. Braun Strowman looks to be at least an inch shorter than Baron Corbin who’s listed as 6’6.5” on multiple sites. Could it be that Braun Strowman “prematurely shrunk” as a result of all the trauma he’s put his body through over the years? Most people who have weighed over 300 pounds for 10 years or more lose height at a faster rate than much lighter individuals (their same height & age) do. I'm not sure looked taller than Strowman. Certainly they are pretty near , you may need to measure them barefoot apart to tell who is taller . He also looked a good 4'' taller than The Rock , so 6'6.5 is reasonable . There's no way this guy is that big. I stood literally 1 foot from him at a WWE live event -- I'm 6'3" and he was only 2-3" taller than me, and that was with those thick-soled boots he had on. Rowan is 6’7” legit ! He’s the same height as my 3rd Cousin, Shane Canterbury...who's exactly 6’7” barefoot. He’s also the son of my 2nd cousin, Mark Canterbury WWF/WWE star ...who used to be 6’4”...but has lost Height & is down to 6’3”. I have the pic of Shane & Eric standing beside each (both in sneakers) not sure how to post a pic on here. If anyone can tell me how? Both men are 6’7”... Rowan was also 315 lbs at the time the pic was taken, Shane was 305. I wouldn't put Rowan anything under 6'6" either. I think rowan could measure taller.. in any case they look quite close. @Demon87 Going by those pictures you'd say Rowan is taller but I think Lesnar was tip toeing on one leg if I remember correctly so that negates some height difference. I think they'd measure quite close to one another both solid 6'6" range. Strowman did look taller when he arrived but he wore lifts. Who do you think is taller ?? I'm waiting for a Bray Wyatt page. No offense to Rowan, but he's not as popular and relevant as Wyatt. @RP: combines actually start around 6am (that’s Rise and Shine). But you’re right about an hour after waking. It said in 2006 that they got drug tested then got their physicals (measured etc). The measurements (based on that) along with the comparisons to Senior Bowl and Pro Days points to about 1 hour out of bed. I saw where Johnny Manziel tweeted at something like 730 or 8 am after his physical. A 6’6.5 for Corbin could potentially mean (in my opinion) 6’6 or 6’6 1/8. 6’6.25 would be an absolute most for him but probably between the former. Why you don’t list erick rowan ? There's still a fair amount of wrestlers to consider. Well, Tom Pestock aka Barry Corbin does have a documented barefoot height measurement 6’6-1/2” from the NFL Combine. Just google Tom Pestock nfl draft scout. Of was officially 6’6-1/2” & 300 lbs. yes, NFL Combine measurements taken in the morning between 8am & 11am..medical .physicals start @ 8am. And they go in position groups in groups of about 20-25 and you go in alphabetical order. So, your measurements will take place between 9am & 11am typically. That being said...that would give him a late evening low of 6’6” .. Rob he looks dead on the same as Corbin here and Braun is in wrestling boots. I'm not sure if they would be exactly the same. If Drew's 6'4.75", then Strowman and Corbin would have to be nearly 6'7". I see him as more 6'4.25"
Corbin is a very solid 6'6, could even be a bit over it. Strowman is 6'6.5/6'6.75. Given how heavy he is his height likely fluctuates quite a bit. He could wake up at 6'7.5. Drew Mcintyre is closer to 6'5 than 6'4 . 6'4.75 would be a great listing if he gets a page . Noticeable “height loss” before the age of 40 is extremely common for tall people who have weighed more than 300 pounds for over a decade. Excessive body weight, gravity, and injuries gradually shrink very heavy people. I think that Adam Scherr was probably around 6’7” (peak), then he lost about an inch of height over the last 10 years or so, which would make him right at 6’6” today. And when they put foot ware on you can add almost 2 inches in height to all of them but don't for get a lot of these guys are older they have lost height over the years. 3-4mm is barely noticeable, so it's not a big deal. 6ft 6 1/2 for strowman ?? I don’t know I watched the segment and Strowman looked taller this time, even in that photo if you look at the top of the image to the top of each their heads Strowman looked taller, maybe Strowman does have half an inch on Corbin. 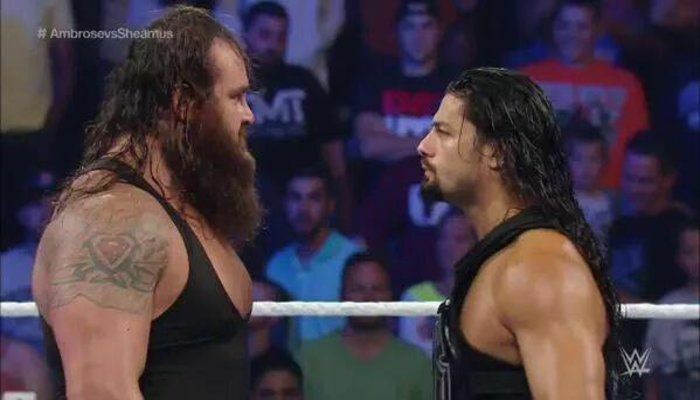 Sometimes though they do look same in height but most of the time Strowman edges Corbin, saying all that though if Kane is billed at 6’7 then Strowman looks barely 6’6, Kane looks at least an inch taller maybe more, could be down to footwear, Braun with his big boots look only 4 inches taller than (IMO) 6’2.5 Lesnar when Lesnar is in his regular trainers so 6’6 flat for Strowman is not out the question and 6’5.5 for Corbin. @Nick Cantan Strowman looks taller there but he could have a slight footwear advantage and he's raising his head a bit. Barefoot they'd probably measure quite close although I'd say Corbin gives a taller impression due to his build and smaller head. Strowman only looks 1/4" taller than Corbin, and it's possible that Strowman has a slight footwear advantage as well. @GS1981 When he looked taller he had lifts and was standing better than Kane. That was when he first arrived in 2015. After that he started wearing a boot which was not as thick so from then onwards he didn't really look taller than Kane. The highest I can see Strowman is probably 6'6.5" as I don't think Kane is too much under 6'7" today (maybe only a 1/4" if at all). Corbin and Strowman pretty much the same height, not sure on strowmans footwear advantage though! I believe 6'9.5" today is alright for him. He looks different heights every time i see him, originally he looked like 2" taller than Kane, then later on he looked a inch shorter, then about the same height, sometimes looking bigger than Taker, others the same height, the same with Corbin, i'm guessing he is 6ft 7 but he could easily be a bit less. I think as far as Kane goes, sometimes Kane has bigger heels depending on how hes booked or who he is booked with, in the recent segments with Taker he had about 2" in height over him, i think Strowman had bigger heels at the beginning in his early segments with the Wyatt family..
Search for the picture of when Big Show returned to ring with slimmer body. Big Show can still look 7" if he can stand straight like in this case. He looked a good 5" taller than Strowman. Show might have slight shoe advantage but Strowman was tip toeing most of the time. I think Braun Strowman is 6' 8" in those boots he wears. Barefoot I'd say he is 6'6". Khali's 6'11.5" IMO. He was listed as 6'11.5" and 6'11 7/8" as a bodybuilder. That would put Big Show at max 6'10", and that was nearly like a decade ago. Nowadays, he probably dropped to 6'9.5", which would put Strowman at max 6'6.5". Even in the suit pic, they look 2.5" apart, so I have no reason to believe that Show wears lifts in the ring. He could've probably just had a footwear disadvantage in the suit pic. Almost as tall as Corbin?? Ing ring, that would explain the barely 1.5 inch height difference between him and the 7'0.5ish Great Khali, that also makes sense as he looks taller next to braun in the ring than in their suits there and dress shoes. Wight 6'10 nowadays, Strowman a few mm's over 6'7. Strowman is a bulky 6'6 man. He is slightly taller than McIntyre and almost as tall as Baron Corbin, but much heavier and bulkier, due to weightlifting career. 6'6 1/2 is my guess. But no way of being 6'8, as billed by WWE, or even more so, 6'10 as "measured" by some announcers. Big Cass was legit 6'8, but he was lanky, awkward, not much talented and mentally unstable, so they retired him. Strowman is currently the most promising big man among the new generation giants. Cass was retired, Corbin is boring to watch, there is also Babatunde - 6'8 or 6'9 man, but he is still a green rookie and not a main event material. Why is 6'6" flat for Strowman impossible but Show at 6'9" isn't? There's very easily a 3" difference, as I've shown you in the pic. And Show right now as of november 2018 can be as short as 6ft9.i wonder if he is depresed about loosing height so fast. That would question Big Show's height as well. Chances are that he's not 6'10" anymore. Maybe 6'9.5" range. B-baller wearing some thick nikes so I doubt there is much of a footwear advantage for either guy there. You're scrambling to make your estimate still seem valid here christian...kanter just 6'9 and strowman footwear advantage. He looks 6'7.25 next to big show and kanter anyone looking subjectively would agree. With Show in the ring that is 3 inch the most,i would rule out 6ft6 easily,6ft6.25 has a chance. Strowman looked 3.5" shorter than Big Show in the ring. I wasn't referring to their recent pic with suits on. Click Here Btw, Strowman had footwear advantage over that 6'9" basketball player as you can see. Click Here so a good 2.5"-2.75" difference. I'm not saying that Strowman's only 6'6" flat (even though I wouldn't rule it out), but there's a better chance he's 6'6.25"
And if u see in the recent pic more than 3 inch between him and Show u need to change your opinion there. It's not a cop out, these are facts. The vast majority of NBA players are measured in the morning. And it's not that I want or don't want him to be under 6'7". I just see him being under 6'7" in most pics. Speaking of Big Show, Strowman looks easily 3.5" shorter than him, and he's listed 6'10". Do you think that Braun strowman might be very similar or identical to strongmen Robert Oberst and Brian Shaw? Both strowman and shaw were listed similarly as strongmen and seeing him taller than baron corbin, about the same as Kane, and barely shorter than big show, do you think strowman might deserve an upgrade back to 6 ft 7 or near 6-8? I would still say Shaw can look taller than Braun. Christian, that seems like a cop out saying it was prob a morning measurement for the basketball player. Maybe he's 6'10 and a few mm's right out of bed then was down to 6'9.75 at the combine. Either way, that pic was bad news for those of you that want this giant Strowman under 6,7 barefoot. Andre, it's ridiculous sometimes...what now big show is just 6'8.5 now? Hahaha. Do agree that someone of Strowman’s size will lose at least an inch during the day. Probably wakes up at a strong 6’7. I agree Annonymous the downgrading on this site has got out of hand 6ft 5-6ft 6 estimates for Strowman were always crazy based on the fact he was listed 6ft 8 in strongman and same height as Brian Shaw in events. Look at this latest pic of Strowman, Show and Kane in Saudi Arabia probably.. Rob how would Strowman look next too a Prime Sid? I would expect him to look very similar in photos. @Christian: I can almost guarantee that’s a morning height for Enis Kanter unless he was measured overseas prior to coming to the States or unless he grew. I highly doubt that that basketball player's legit 6'9.75" at his low. Almost always they're morning measurements. 6'7.75 out of bed, 6'7 evening. Based on the photo with the 6'10ish basketball player he needs to be fixed back to a 6'7 listing. Some proof there that downgraders get too extreme. Yeah, he could've been around 6'6.5" peak and 6'6.25" today. Correct on Braun (Adam) in 2012 (6 years ago) I personally witnessed Adam (Braun) get measured in the morning at 6’7-1/2” & 402 lbs! There’s no question being a 350 pound to 400 pound man that he will lose At least 3/4” during the coarse of a day. Possibly even a full inch, considering the majority of his days involve extremely heavy weightlifting...and now taking hard bumps in the wrestling ring. And that was also six years ago, so, it’s very possible if not likely he’s lost 1/4” of his peak height. Considering he has spent the last 10 to 12 years of his life walking around at anywhere between 340 to 420 pounds at his heaviest ... and constantly lifting extremely heavy weights ... and now he’s working in an industry that probably creates and accelerates height loss more than any industry or sport known to man...other than coal mining. Doesn't look under 6'7" assuming Kanter's 6'9.75", but that may be a morning measurment. Kanter could be 6'9" and Strowman 6'6.25" at evening. Actually they looked 1.75" apart. Drew's posture wasn't that great. Yeah 6’6,25 could be closer to the truth as barefoot height. His footwear advantage could account for the perceived height difference with Drew tbh. Braun & Drew McIntyre finally had a good legit eye to eye staredown tonight in the ring on RAW. And Braun was 2.25” taller. A little over 6'6 is fair for Strowman. Looks closer to 6'6 than 6'7 a lot of the time. 6ft 8 looks too much, 6ft 6 too low, I think 6ft 6.5-7 range is quite arguable. Anywhere in that. Drew honestly looked around 1.5" shorter than Strowman. If Drew's weak 6'5" (6'4.5"-6'4.75"), that puts Strowman at max 6'6.25"
Drew looks a weak 6’5 tbh so Braun could be 6’7. Just saying! I think he's 200 cuz he stands next to Brian Shaw and he looks shorter. Shaw claimed to be 203. Drew with 6 foot Bret Hart - Bret could be a little shorter maybe? Drew's no shorter than 193-194 range. Maybe 6'4.25" or so to be exact. After watching Raw this past week Braun was next to Drew McIntyre in the ring. Now I got to meet Drew early 2018 in the U.k to me he was a good 6'3 maybe 6'3 and a half but after seen him next to Braun I was surpised, Braun didn't look no more then 6'5 I was really shocked thought he was 6'6 or a little more he really is a bit shorter then we all think. I agree. 6'6.25" could be the max. I used to think he was 200cm but I was a bit naive. On the last episode of "Monday Night Raw", Braun looked 4 inches taller than Roman Reigns. He was also not taller than Baron Corbin, which is 6'6. Therefore, my opinion is that the "Monster" is 198 cm / 6'6 or 6'6.25". 192.5 is the most that Orton looks with 186 current Triple H. I used to think Orton was solid 6'4", maybe even 6'4.25" but he seems to be under than over. As for Strowman, one visitor here met him and said he looked 6'6", plus he looks about 6'6" with 6'7.75" listed Hafthor Bjornson whom Rob met. Strowman could be 6'6.25" but not 6'6.75" or 6'7". Orton's more 192.5 and Strowman 198.5 IMO. Looks every bit a solid 2m tall. That match against a post-peak Big Show when they collapsed the ring, he was almost eye to eye(with a slight footwear advantage) And generally measures up equally well to a peak Kane, both in height and physique. Hello Rob, if Braun is 6'6.75 how tall does that make Finn Balor, Hideo Itami (fka Kenta) and NXT's Lars Sullivan? What do you say Rob? Anyone? @heightchecker34 I've seen another video with another angle and taker does look around 3 inches taller. I think it's because when he's having the staredown he's tilting his head down a bit and he doesn't have the best posture either. As for that specific video it could just be the camera because it's shooting from a lower angle and slightly towards the left. I can't see Undertaker being over 6'6.25" today so the most I'll give Strowman is 6'6.25" as well. Maybe that one visitor was right when he met Strowman and said he looked 6'6". Rob, in that video below... how is Roman Reigns the same height as Taker? It looks like Roman is 6'6 all of a sudden! Is he standing on a box or wearing huge lifts? Even video angles or lighting cannot explain this one. A 6'2 guy should not be able to look at a legit 6'6 man in the eyes. Strowman is defeinitley not taller there,even if we take into account a small angel tilt in takers favour. They look quite close, enough that it would probably need a measurement to say for sure. Undertaker looked like half inch taller than Taker in MSG.. Taker is still 6'7' in wrestling boots, Strowman too might be 6'7' in boots but looked a slight shorter than Taker..
@Christian 6'5 3/8" Yeah even the giants they have aren't 'larger than life' enough for them. I mean Andre was 7'0 and they still had him stand on a box while being interviewed to make him appear taller. Yeah I believe Show was billed at 7'2 in WWE back then. It reminds me of how The Big Show's billed 7'0" nowadays but during his WCW days he was billed 7'4" or something like that, and even when he was in the WWE long time ago he was billed higher than 7'0". Why don't the WWE make up their minds? Is he gonna be 6'11" next week? Might be a good 3 inches smaller. Wrestlers have always been exaggerated by several inches. You have some moderate ones like Cena, Reigns, Lesnar, Orton and Rollins but the majority are billed at least 2-2.5 inches higher. @tree Wrestlers nowadays aren't as big and tall as they were back in the days so that probably explains why they're billing the few modern day wrestlers who are tall at 7'0 (like Strowman and Cass). Atm in wwe all of the modern day wrestlers are below 6'8 with the exception of Cass who measures in that range. So if anything I can sort of understand them doing it now but in the 90's it was unnecessary (some of them were already larger than life). It's gone to the point where 6'6"-6'7" wrestlers are being called 7'0" now. What's next, Roman Reigns and Brock Lesnar are 6'9"? It's intresting from 2010 and than they started to bill them only 1-2 inch taller,now they are doing the same sh*t again like in the 90's and give them 3-4 inch? @Christian-6'5 3/8 Well he's only listed 1/4 inch away from 6'7 which isn't even noticeable really so 6'7 is probably a fair bet and this is just an estimate aswell after all. Nash and Cass have a better chance of getting away with it because of their proportions i think. I used to think Nash was very close to 7'0 when i was younger and Cass I guessed at around 6'9. I think his long legs do give a tall impression imo so he looks nearer to 7'0 along with Nash than someone like Strowman. Nowadasy almost everybody knows heights are exagerated giving him 6ft8 is enough. I bet they would a monster who is 6ft11 and muscular and moves like Strowman but near 7ft guys are just not that agile,Strowman at 6ft7 is fast for someone his height and size. U cant be 7ft tall big and move fast in the same time,Big Show was the qutie good when he was much younger,but thats rare,and still not as agile as big Braun. At least guys like Kane, Nash and Big Cass are over 6'7" so they probably could've gotten away with it to a degree. But Strowman isn't even 6'7" so it's a really stupid billing. @ced Yeah i always wondered why they never billed Strowman at 7'0 considering they did with Kane and they're both in a similar range. It's ridiculous anyway because even in his boots he's nowhere near it. Clear example when he stood with Drew McInryre (billed at 6'5) and he only looked a couple of inches taller. That's also when the commentator said he's 7ft and i just laughed. Babatunde was listed 6’8 in football. He’s a good 2” taller than Strowman. But you said he's 6'6" though. I've noticed that the commentators are now describing him as 7 feet tall, which is stupid because he's always listed 6'8". They're not fooling anyone. Braun Strowman might just be closer to 6'7' in the morning and dip down to 6'6'5 in the evening.. He's that heavy that he's probably about 6'8 first thing then drops to just under 6'7 later in the day. Staredown with 6'9'' 370Lbs. Babatunde Aiyegbusi during The Greatest Royal Rumble. Strowman looks at least 6'7'' here. "in this photo strowman is next to The Mountain (from GOT), Thor is a legit 6.8 and Adam (Braun) looks 2 inches shorter. Results: Strowman is a solid 6.6"
It's a bit surprising that WWE hasn't listed Braun as 7 feet tall, they usually over exaggerate a lot more with monsters, as we all know. 6'8" is believable for him, even though he's probably a little bit under it. Strowman is closer to 6'7' but not 6'7'..He might be 6'6'5 on early morning but dip down to 6'6' by the evening..
Because kane is taller but he has more footware advantage. My question is: both man barefoot, for you rob kane still taller ? I think that strowman is taller. I wouldn't have guessed there was much between them that moment. But Strowman has a large head and Bray's standing a bit closer to the camera. That's about a 5.5" difference. Rob do you think that kane without wrestling boots still taller than braun ?? I doubt Kane would be taller barefoot versus a boots-wearing Braun. Rob, Eric Rowan actually looks taller than Braun there. Even if he's nearly 6'7", he's still a massive dude. Thor the Icelandic giant was listed at 6'9",that puts Braun at about 6'7" if he,s 2 inches shorter. Thor The Icelandic giant is NOT 6'9". He's about 6'7.5" barefoot. There is an interview with glen jacobs where he clearly states he is 6'6 but cant remember the exact one' wwe always hollywood heights for wrestlers' I am 188cm and met a few of the wrestlers at the midland hotel in manchester uk when Raw was in uk years ago' i was stayimg their at the same time' probably 90% of them were the same height or smaller than me' i think only jacobs' orton (only by. Hair line) and big show were taller than myself and i would say 6'6 is correct for him. Hhh is at most 6'1.5 as I had half an inch to an inch on him. I was not impressed with the size of moat of them and can easily say wwe big their heights up for show. Kane WAS 6'7" at his tallest (same as Undertaker). It is quite possible that he's down to 6'6" these days, considering Taker is about 6'5.5" today. 6'8 in wrestling gear, a hair under 6'7 barefoot. Do people still forget the change in footwear every so often? Click Here Baron Corbin listed 6'8", set at 6'6" here. Matt Bloom likely 6'6". NExt to 6'3" Konnor. Rob please add rowan.. for me he’s slightly taller than big braun . @Mike1979 I've seen an interview where he claims 'around' 6'8" but never 6'6" I I would love to see it if you could try find it? Would definitely put his height to bed. Brian Shaw in my opinion isn't more than 200cm or absolute highest 6'7". @ Tree, he doesn't look taller than Brian, he is standing closer to the camera. Braun is the same height as Erick Rowan 6'7"
6'4 Swagger? That dude is 6'5-6'5.5. I meant an inch or more shorter than Judge !! Corporate Kane looked 6-7 inches taller than Seth many times and remember that Seth always has his big wrestling boots on which gives him a decent footwear advantage over Kane's dress shoes. And also they would usually do camera angles to make Seth look bigger than what he is. Kane could just be 197-198cm today and wears lifts to look taller than a 199-200cm Strowman. I don't think he is downgraded good enough,now he must be listed at 6'6.5". Then probably it will make a good estimate. Anonymous is 100% correct on everything he said! WWE have put Kane in larger lifts to make him seem as meansacing & huge as he used to be! The Corporate Kane run in 1" dress shoes is all the proof you need!! Braun (Adam) was actually 0.5" taller than Kane (Glenn) back in his Wyatt Family days! Several stare downs to prove it! Adam has a morning barefoot measurement of 6'7-3/4" & 402 lbs from a Strongman competition back around 2012-2013. Morning 6'7.75"...evening 6'7.25"...I guess @ 350-400 lbs he could lose 0.75" during s long day & hit 6'7" even? Might as well lower Kane too, Rob. Barefoot they may be the exact height. Strowman was slightly taller than Kane while with the Wyatt family when they were going at it with the other family of destruction (Kane and the Undertaker), so unless Scherr was in lifts its safe to say they're both around 6'7'' evening height. Randy Orton is at least 6'4'' this has been proven over and over. in this photo strowman is next to The Mountain (from GOT), Thor is a legit 6.8 and Adam (Braun) looks 2 inches shorter. He does not look 2 inches shorter than the Mountain at all, try maybe 1. Camera angles people. Kane only looks taller than Strowman because of his thick wig and thicker boots. Rob... Is eric rowan taller than strowman?? Editor Rob: not so sure on erick! Will you give him a page? He looks like Monsterbootet Kane or Nash facing peak Big Show and about an inch taller facing Strowman. Do you still think 6´7" is ok for Braun or is it downgrade time, I mean Orton needs to be in BIG lifts to make Strowman 6´7"? Editor Rob: I think a fraction under 6ft 7 is safe enough to give Braun. I think after the recent video evidence on RAW Kane and Braun's heights need to be reassessed. There is no way they can still be listed as the same height now. I do not think there is much more than an Inch between Kane and Braun. I could be wrong b/c Kane usually has thicker Shoes, but If Strowman is 6'6, Kane is 6'7, 6'7.25. tops. Hey rob, what is the real height of randy Orton in cm?does he same height with Braun strowman? I think Randy at times can seem 193-4cm, Braun can look as short as 198cm sometimes too! How can you put Strowman at only 6'6" yet in the same breath put Kane at 6'7.5"-6'8"? Check out this weeks RAW just gone, there was a tremendous prolonged camera angle that demonstrated a clear at least 1-1.5 inches differences between Kane and Braun and Kane was slouching. I would go with Braun 6'6 and Kane 6'7.5 - 6'8. From what I am Reading below from you guys, Strowman is closer to 6'6 than 6'7. Still a undoubtedly huge man. Imagine him coming at you with bad intentions in a real life situation? I know I know, everyone and their mother knows MMA nowadays.....ain't gonna work on a Mofo this size. Strowman is a solid 6’6. Kane is 6’7 today. Taker is 6’5.75 today. Luke Gallows is 6’4.75. Big Show is 6’9.5 (prime was 6’10.5) Kevin Nash is 6’7.5 (today, was 6’8.75 prime). Sid in his prime 6’6.75. Prime Undertaker: 6’7. Prime Kane 6’7.5. Bradshaw: 6’4.75 prime. Today: 6’4. Big Cass: 6’7.75. Matt Morgan: 6’7.5. Test: 6’5 prime. Did you pay attention to his footwear when you met him? Hes Not 6 foot 7. Im 6 foot 6 and hes the same height as me or a tad shorter. Met him in person. Those professional strongman competitions in ontario where im from always exaggerate height. Im 199.5 cm and hes probably 198. I'm extremely doubtful that Braun Strowman is anywhere above 6'6. Now in shoes that's a different story. In shoes he might get about an inch to 1.5 inches making him 6'7 or 6'7.5 in shoes but highly unlikely barefoot. And Strowman being 6'9 is ridiculous. He isn't even 6'8 I know a guy who is 6'8 or 6'9 and he puts that case to SHAME. Even Kane probably isn't anywhere over 6'7.5 nowadays and Kane seems to edge him out by a marginable fraction. He's about head-to-head with the Undertaker who I'm confident is in the 6'6 margin nowadays and at maximum 6'7.5 or maybe even as much as 6'8 in his youth. At best 6'6.75", I'm betting that he's 6'6.5" or 199-200cm range. 6'5.5 is just sillyness that needs to stop. This guy got really famous because of what a cool giant he is...6'5/6'6 guys just dont stand out as larger than life as Braun Strowman does. The dude is about 6'9'' in wrestling boots and a freaking goliath in build. Thats a fact.